Delano Las Vegas (formerly known as THEhotel) is a 43-story 1,118 room luxury suite hotel. It is owned and operated by MGM Resorts International. It is located within the Mandalay Bay complex on the Las Vegas Strip in Paradise, Nevada. It opened on December 17, 2003, as "THEhotel at Mandalay Bay." In 2012, owner MGM Resorts International announced a partnership with Morgans Hotel Group to rebrand the hotel as Delano Las Vegas. Construction to rebrand the hotel began in April 2014. Several floors were worked on at a time, allowing much of the hotel to remain open during renovations. The Delano held its grand opening ceremonies in September 2014. The hotel includes an Alain Ducasse restaurant called "Rivea" and a lounge called "Skyfall", both located at the top of the hotel. On May 23, 2002, the Mandalay Resort Group announced plans to build a 1,122-room all-suite hotel tower. The 41-story tower would connect to the company's Mandalay Bay resort on the Las Vegas Strip. The new tower's target clientele was attendees to the resort's Mandalay Convention Center, scheduled to open in January 2003. The tower would cost between $200 million and $225 million, with groundbreaking scheduled for September 2002, and an opening expected for October 2003. The tower's cost was later increased to $250 million. In September 2003, Mandalay Resort Group announced that the tower's then-scheduled Thanksgiving opening would be delayed to late December 2003. The company also announced that the tower, located northwest of the main resort, would be named "THE hotel at Mandalay Bay". Mandalay Resort Group spokesman John Marz said, "We put some names out in front of the public and tested their response. THE hotel at Mandalay Bay is all about style. It's fresh and new." The tower would be marketed as a separate property from the Mandalay Bay, and would have its own porte-cochère, check-in area, restaurants, employee uniforms, and spa. The tower was topped off on October 17, 2003, and Mandalay Resort Group announced that the tower's name would be spelled "THEhotel at Mandalay Bay". The hotel hosted more than 100 local reporters for a media preview the night before its official opening on December 17, 2003. The hotel did not have gambling, but provided access to the nearby casino at the Mandalay Bay. Although the gold-paned, 43-story tower had the same exterior appearance as the main resort, its interior design was entirely different. The company stated, "While Mandalay Bay represents an idyllic tropical paradise, THEhotel embraces modern architecture, contemporary design and comfortable surroundings." The new tower employed approximately 700 people. The hotel included original artwork by Jasper Johns, Andy Warhol, and Arturo Herrera. Included in the hotel's public areas were pieces by Robert Rauschenberg, Richard Serra, Valérie Belin, and Donald Judd. In January 2005, the hotel was among other establishments to win AAA's Four Diamond Award. In 2006, the lettering at the top of the tower changed to "THEhotel" to distinguish the property. Formerly, the lettering was identical to the "Mandalay Bay" letters at the top of the original tower. In 2011, the hotel became one of the few Las Vegas Strip hotel properties to allow dogs. Later that year, Travelocity included the hotel on its list of the top 10 hotels in Las Vegas, based on customer reviews. On August 6, 2012, MGM Resorts International announced the rebranding of THEhotel into the Delano Las Vegas as part of a partnership with Morgans Hotel Group. Through the deal, MGM would manage the hotel under a licensing agreement with Morgans Hotel Group, which owned the Delano brand. All of the suites at the hotel were to be redesigned, along with new bars, lounges, restaurants and nightclubs. The renovations and name change were initially expected to be complete by late 2013, which was later changed to spring 2014. Although THEhotel had been financially successful, the decision to renovate and rename it was part of a transformation at the Mandalay Bay. In addition, there had already been plans to renovate the nine-year-old hotel tower prior to forming a partnership with Morgans Hotel Group, which had been expanding the Delano brand. Morgans Hotel Group previously planned to open a Delano hotel at the cancelled Echelon project on the Las Vegas Strip. Mandalay Bay president and chief operating officer Chuck Bowling said that while people enjoyed THEhotel, it "in many cases, was a tower of Mandalay Bay. What we really want to do at Delano is create its own spirit, its own energy." Because the design phase took longer than expected, MGM announced in September 2013 that the property's renovation would be delayed several months. It was announced the following month that design plans had been finalized and that construction for the hotel's conversion was expected to begin in March 2014, for an opening in the third quarter of the year. Construction began in April 2014. To avoid major room closures, only a few floors were worked on each week leading up to the eventual completion of renovations, which also included revamping the lobby. Other changes included redesigned hallways and furnishings. The renovations cost $80 million, and largely took place inside the tower, which retained its gold appearance. THEhotel signs were removed from the tower in June 2014, and were replaced two months later with new signs for the renamed hotel. Delano Las Vegas officially opened with a ribbon-cutting ceremony on September 2, 2014. A grand-opening party was held on September 18, 2014, with Samantha Ronson as DJ and a performance by Magic!. The party was also attended by Charlotte Ronson and actress Jaime King. The hotel's penthouses were the last remaining rooms to undergo renovations, with completion expected for October 2014. The new property was inspired by the Delano South Beach in Miami, while also having a Mojave Desert theme in addition to an abundance of white coloring. Delano Las Vegas is also an homage to 32nd U.S. president Franklin Delano Roosevelt, and included the Franklin lounge as well as iceboxes resembling Roosevelt's hat box. On display in the hotel's entrance was a 126,000-pound metaquartzite boulder, divided in half. The boulder, approximately 150 million years old, was nine feet tall and five feet deep. The hotel's designers had discovered the boulder while trekking in the Mojave Desert in Jean, Nevada, and the process to transport it to the hotel included the use of a 240-ton hydraulic crane. The tower, with 1,118 rooms, brought the Mandalay Bay's total room count to 4,762 upon its opening. It offered the largest standard suites in Las Vegas, measuring 725 sq ft (67.4 m2). The hotel's first floor included a bar, a 24-hour restaurant, and a 60,000 sq ft (5,600 m2) lobby. Floors 3 through 6 contained 80 business suites as well as conference space. The tower's regular suites were located on floors 7 through 38, while floors 39 through 41 contained VIP suites from 1,500 sq ft (140 m2) to 2,600 sq ft (240 m2). The 24-hour restaurant, known as The Cafe, had seating for 150 people. A $25 million spa was expected to open in the first quarter of 2004. Mix, a restaurant and lounge by Alain Ducasse, opened in December 2004 on the 43rd floor. The restaurant included seating for 240 people, and floor-to-ceiling windows that provided a view of the Las Vegas Strip, while the lounge included an outdoor patio area. The restaurant also included a $500,000 chandelier made of 13,000 glass bulbs. The spa, known as The Bathhouse, contained 15,000 sq ft (1,400 m2). Men made up 40 percent of the spa's clientele. A new restaurant, the 140-seat Delia's Kitchen, opened along with the Delano in September 2014. A greenhouse was built at the hotel to provide the restaurant with fresh herbs. Also opened in the lobby was a coffee bar, 3940 Coffee + Tea, named after the hotel's address. In April 2015, the hotel opened its Delano Beach Club to guests. The club included 16 cabanas and offered poolside amenities such as free food and drinks, as well as DJs two days a week. The club was also open to non-guests who reserved a cabana. Mix was replaced by Ducasse's Rivea restaurant and Skyfall lounge in October 2015, marking the end of the Delano rebranding process. Rivea served Mediterranean food while Skyfall offered DJs and 180-degree views of Las Vegas. A room previously used by the Mix restaurant to store plates and other items was converted into Rivea+, a private dining room for VIP guests. Delano Las Vegas retained the Bathhouse Spa. At 725 square-feet, the Delano rooms remained among the largest standard rooms of any hotel on the Las Vegas Strip. Rooms included 28 penthouses, and dog-friendly suites. ^ Benston, Liz (May 24, 2002). "Mandalay building all-suite tower". Las Vegas Sun. Retrieved October 7, 2017. ^ "This Way to Mandalay". Las Vegas Review-Journal. March 13, 2003. Archived from the original on November 6, 2004. ^ a b c "Mandalay Bay names but delays new tower opening". Las Vegas Review-Journal. September 24, 2003. Archived from the original on October 30, 2004. ^ a b "All Spruced Up". Las Vegas Review-Journal. October 18, 2004. Archived from the original on August 1, 2004. ^ Benston, Liz (September 25, 2003). "Mandalay names new tower "THE hotel at Mandalay Bay"". Las Vegas Sun. Retrieved December 11, 2018. ^ a b c "Company finalizes name for new tower". Las Vegas Sun. October 15, 2003. Retrieved October 7, 2017. ^ Clarke, Norm (December 17, 2003). "Caged Saddam a hit for comic". Las Vegas Review-Journal. Archived from the original on November 19, 2004. ^ "The Hotel opens at Mandalay Bay". Las Vegas Sun. December 18, 2003. Retrieved December 7, 2018. ^ a b c d e Scherzer, Barbara (December 19, 2003). "New tower, THEhotel, opens at Strip resort". Las Vegas Business Press. Archived from the original on January 7, 2004. ^ a b Simpson, Jeff (October 14, 2003). "Don't let exterior of tower fool you: New building at Mandalay Bay same outside, much different on inside". Las Vegas Review-Journal. Archived from the original on November 6, 2004. ^ McDarrah, Timothy (December 18, 2003). "Art sets new Mandalay Bay hotel apart". Las Vegas Sun. Retrieved December 11, 2018. ^ "Restaurant, hotel join prestigious AAA list". Las Vegas Sun. January 17, 2005. Retrieved December 7, 2018. ^ Knapp Rinella, Heidi (January 18, 2005). "Four Diamond Awards: Andre's, The Hotel newest AAA honorees". Las Vegas Review-Journal. Archived from the original on January 4, 2006. ^ Leach, Robin (March 24, 2011). "Photos: The Hotel at Mandalay Bay, Trump Hotel have gone to the dogs". Las Vegas Sun. Retrieved December 7, 2018. ^ "Travelocity customers choose their 10 favorite Las Vegas hotels". Las Vegas Sun. October 12, 2011. Retrieved December 7, 2018. ^ "The Hotel to be rebranded as Delano Las Vegas". Las Vegas Review-Journal. August 6, 2012. Archived from the original on August 8, 2012. Retrieved 2012-08-07. ^ a b Shine, Conor (August 6, 2012). "The Hotel at Mandalay Bay will become Delano Las Vegas next year". VegasInc. Retrieved December 11, 2018. ^ a b Leach, Robin (25 September 2012). "Mandalay Bay plans to announce changes, Delano work Oct. 15; 'Iron Chef'". Las Vegas Sun. Retrieved December 11, 2018. ^ a b c Leach, Robin (May 1, 2014). "Q+A: Mandalay Bay president, Delano GM talk all-suite, South Beach chic hotel". Las Vegas Sun. Retrieved December 11, 2018. ^ a b c Katsilometes, John (September 8, 2014). "Like SLS, Delano Las Vegas seeks a new sense of self". Las Vegas Sun. Retrieved December 11, 2018. ^ Stutz, Howard (September 16, 2013). "MGM: Renovation of The Hotel at Mandalay Bay being delayed". Las Vegas Review-Journal. Retrieved December 11, 2018. ^ Leach, Robin (October 7, 2013). "Strip Scribbles: SLS Sahara plans and The Hotel at Mandalay Bay makeover". Las Vegas Sun. Retrieved December 11, 2018. ^ a b c d e f g Leach, Robin (September 2, 2014). "Delano Las Vegas opens with South Beach chic, no gaming and no smoking". Las Vegas Sun. Retrieved December 11, 2018. ^ a b c Leach, Robin (April 30, 2014). "First look: Miami vibe heads to the Strip with all-suite, desert-themed Delano Las Vegas". Las Vegas Sun. Retrieved December 11, 2018. ^ a b c d Stutz, Howard (September 2, 2014). "Delano Las Vegas: South Beach meets Mojave Desert". Las Vegas Review-Journal. Retrieved December 11, 2018. ^ a b Stutz, Howard (May 1, 2014). "MGM details $80 million rebranding of The Hotel to Delano Las Vegas". Las Vegas Review-Journal. Retrieved December 11, 2018. ^ Stutz, Howard (May 12, 2014). "New feel, new story as The Hotel becomes Delano". Las Vegas Review-Journal. Retrieved December 11, 2018. ^ a b c Chareunsy, Don (September 3, 2014). "Photos: A tour of Delano Las Vegas on opening day". Las Vegas Sun. Retrieved December 11, 2018. ^ Damon, Mark (June 13, 2014). "The Hotel sign makes way for Delano Las Vegas". Las Vegas Review-Journal. Retrieved December 11, 2018. ^ Scheid, Jeff (August 7, 2014). "Exterior signage complete for Delano Las Vegas". Las Vegas Review-Journal. Retrieved December 11, 2018. ^ Leach, Robin (September 21, 2014). "Delano's stylish start with Jaime King, Charlotte Ronson, Magic! at grand opening". Las Vegas Sun. Retrieved December 11, 2018. ^ Leach, Robin (September 17, 2014). "Delano Las Vegas, with its hot desert theme, is cool, hip and South Beach chic". Las Vegas Sun. Retrieved December 12, 2018. ^ a b c d Katsilometes, John (August 31, 2014). "What to know about The Other Hotel opening". Las Vegas Sun. Retrieved December 11, 2018. ^ THEhotel at Mandalay Bay. PRNewswire. January 8, 2004. Archived from the original on June 18, 2004. ^ White, Ken (April 28, 2004). "The Cafe offers twist on typical coffee shop menu". Las Vegas Review-Journal. Archived from the original on October 30, 2004. ^ Stevens, Muriel (December 17, 2004). "Mix up at The Hotel at Mandalay Bay". Las Vegas Sun. Retrieved December 12, 2018. ^ a b Clarke, Norm (December 31, 2004). "Mix sits diners under bubbles". Las Vegas Review-Journal. Archived from the original on January 3, 2005. ^ White, Ken (March 9, 2005). "Famed chef's first Vegas venture offers his classic dishes". Las Vegas Review-Journal. Archived from the original on September 21, 2005. ^ Kumler, Emily (May 19, 2005). "Calling all men: Masculine treatments on the menu at The Bathhouse spa". Las Vegas Review-Journal. Archived from the original on May 25, 2005. ^ a b Rinella, Heidi Knapp (September 13, 2014). "Della's Kitchen and "Dumplings All Day Wong"". Las Vegas Review-Journal. Retrieved December 12, 2018. ^ Chareunsy, Don; Leach, Robin (March 23, 2015). "Strip Scribbles: Jeff Dunham extends run; Penn & Teller AIDS Walk grand marshals for 14th year". Las Vegas Sun. Retrieved December 18, 2018. ^ Cooper, Jeanne (May 28, 2015). "Moscow art museum reopens in Koolhas building". SFGate. Retrieved December 18, 2018. ^ a b Chareunsy, Don (July 23, 2015). "Alain Ducasse's Rivea, Skyfall Lounge set to open at Delano Las Vegas this fall". Las Vegas Sun. Retrieved December 12, 2018. ^ Clarke, Norm (October 20, 2015). "Ducasse restaurant puts up in upscale". Las Vegas Review-Journal. Retrieved December 12, 2018. ^ a b Katsilometes, John (October 25, 2015). "New look makes the most of Mandalay Bay's great view". Las Vegas Sun. Retrieved December 12, 2018. 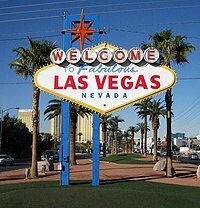 ^ "Luxury Travel: Weekend in Vegas". 5 April 2018. ^ Cox, Jane (August 25, 2015). "Jane Cox of Bathhouse Spa at Delano Las Vegas: Trends, most popular male treatments". Las Vegas Sun. Retrieved December 12, 2018. Wikimedia Commons has media related to Delano Las Vegas.